This holiday season, we’re here to help you make seamless, quick and stylish transitions between work and social events. Take your outfit from work-appropriate to party-ready in a matter of minutes by focusing on pieces that you can easily re-style! During the day, a blouse paired with a fitted trouser and a neutral shoe will keep you looking chic and office appropriate. Add coverage with a cami and finish your buttoned up style with your favorite blazer. To dress yourself up for the party, simply switch out your trousers for a knee length skirt and add pops of color with a brightly hued pump and a sparkling statement necklace. 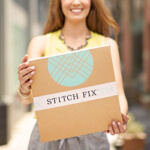 Swap your functional computer bag for a festive clutch and you’ll be on your merry way! For a polished professional outfit, try wearing a skirt with a collared blouse, sweater and flats. Don’t forget to add a pair of tights to keep your outfit cold weather appropriate! Take your look from daytime to dazzling by changing into a sparkling top that you can tuck into your skirt for a streamlined silhouette. Complete your look with a fun pair of pumps, a piece of statement jewelry and a small shoulder bag for holding your party time essentials. 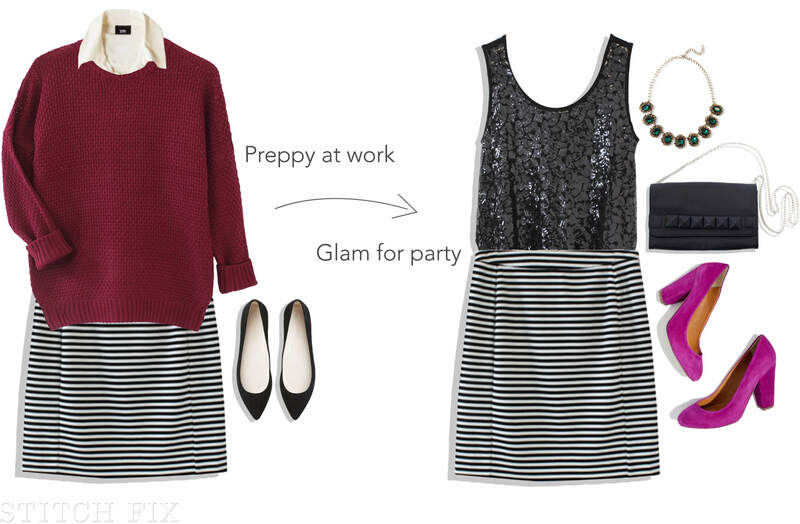 A dress is easy to transition from the office to the party with minimal effort. 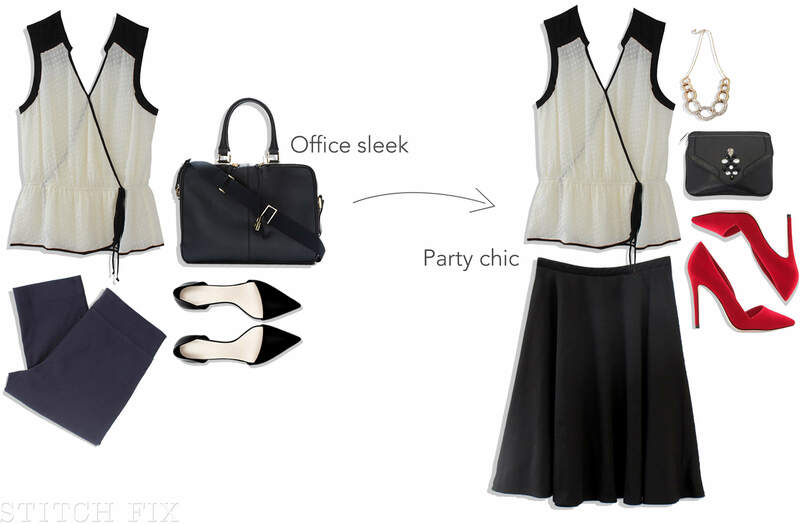 For a pulled-together look for your work day, accent your dress with a cropped cardigan and pumps. When it’s time to head to the party, simply remove the cardi and add some subtle sparkle with a crystal necklace and clutch.